In fall 2006, former DJ, point guard and teacher turned first-time principal, James O’Brien, opened a small public high school in Bedford-Stuyvesant, Brooklyn, where 1/3 of residents live below the poverty line and the graduation rate is 40%. With infectious optimism, O’Brien and his team of eight undertook an unconventional approach and ambitious mission: Create a school with an arts-oriented curriculum that also emphasizes self-development, community collaboration and social change. Initially, the buzz from everyone was that this was a dream come true. But conflicts arose when untested idealism was challenged by long-standing realities far bigger than school. 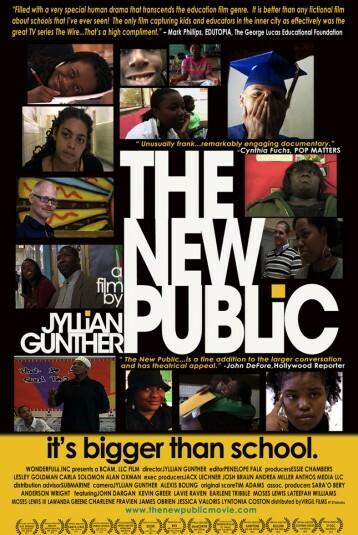 Over four years, this heartfelt verité film follows the journey of students, parents and educators striving to make a difference in the futures of young people whose lives are stark representations of our country’s education and opportunity gaps. Through the prism of one inner-city public school, we witness complexities faced by urban public schools and communities everywhere. "The New Public is an unwitting primer on how to teach disadvantaged students . . . As the country continues to struggle with education reform, it seems obvious that education schools need to change, so that prospective teachers walk into their first classroom knowing how to teach. Maybe 'The New Public' can help bring about that change."